As ancient reptiles, snakes have fascinated and frightened mankind for centuries. They’ve stood as strong symbols in thousands of stories, from modern fiction to religious scripture. Below, we’ve put together a snake tattoo dictionary, explaining the meaning behind several different versions of snake tattoo designs. Read on, and be charmed by the snake’s mysterious allure! Dragon and Snake: together, the dragon and snake are a symbol of balance. 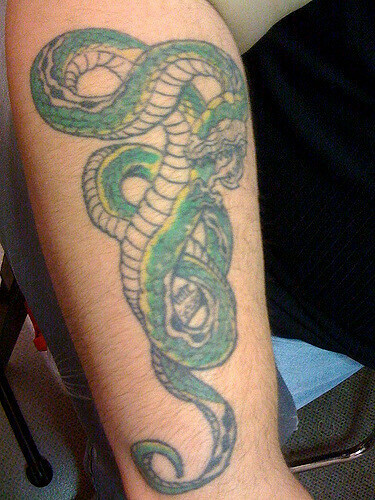 While dragons represent the wild and passionate, the snake represents the calm and cunning side of nature. 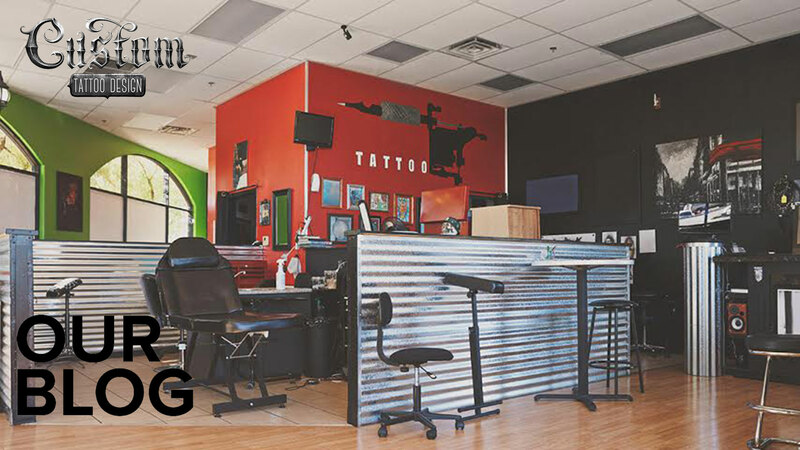 Eagle and Snake: this tattoo design is an expression of the conflict between doing what is right versus giving into temptation. 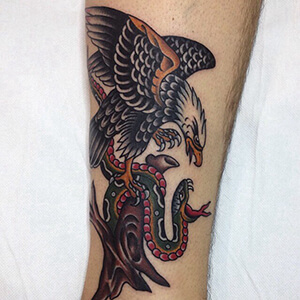 The snake represents sexual passion, and the eagle represents nobility and morality. In most versions of this tattoo design, the eagle is portrayed as the victorious one. 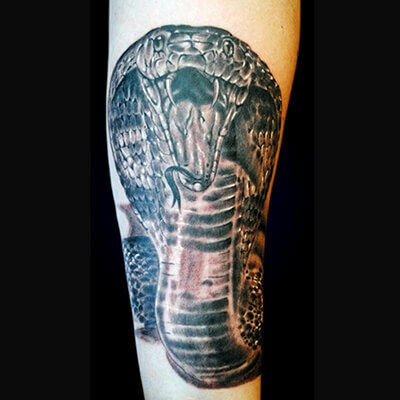 King Cobra: believed to protect the charmer from snake attacks, the king cobra tattoo design is considered a sacred symbol, representing nobility and wealth as a tattoo design. 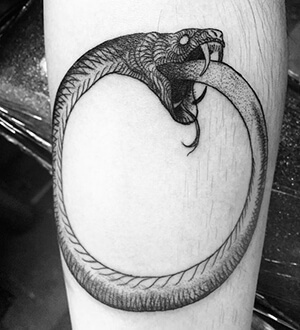 Ouroboros: this tattoo design shows a snake in a ring shape, eating its own tail. This ancient Asian symbol represents the cycle of life, including birth and death. Rattlesnake: honoured by the Aztecs, the Mayans, and native Central Americans, the rattlesnake tattoo design represents unknown strength and the undying spirit of the underdog. 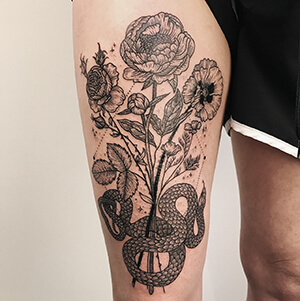 Rose and Snake: together, the rose and snake tattoo designs are the ultimate symbol of temptation. They also represent loss of innocence and beauty. 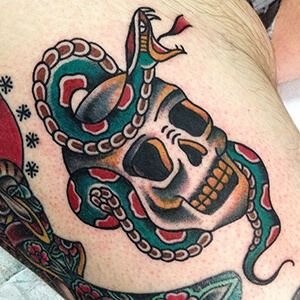 Skull and Snake: a strong symbol of death and decay, the skull and snake tattoo design is a reminder of man’s mortality. These serpents are a powerful force of nature, symbolizing man’s primal desires and instincts as well as an obstacle to our spirituality. While some snake tattoo designs stand for mortality and evil temptation, others represent noble principles and the power of resilience. 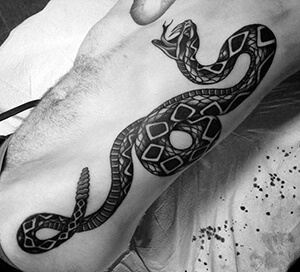 If you know of any other exceptional snake tattoo designs, let us know about them in the comment section below!